The queue for the merchandise stand on the pavilion is longer than the ones to enter Etihad Stadium. People wait ten, fifteen, twenty minutes, even after the preliminary fights have commenced. They want their Reebok-branded keepsakes. They want to declare their allegiance to reigning champion Ronda Rousey with a AUD$110 t-shirt, or a $10 stubby holder at the very least. Rousey is a phenomenon, a prodigy, an icon. The most successful female Ultimate Fighting Championship (UFC) competitor in the short history of the women’s bantamweight division, undefeated in her professional mixed martial arts career, sending her opponents home with busted elbows or splitting headaches in a matter of seconds. 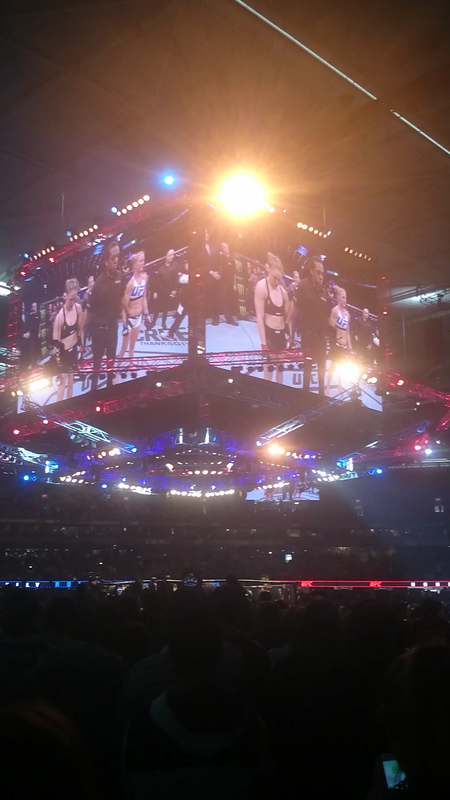 A promo video plays again (and again and again) on the big screens around the stadium, a slow-motion montage of key points in Rousey’s life – childhood introduction to judo, 2008 Olympic bronze medal, training for the UFC. The plan, Rousey says, is to retire undefeated. The 7:1 betting odds against her opponent, fellow American Holly Holm, are pretty confident that Rousey will take another step towards that goal today. The UFC is banking on Rousey’s invulnerable allure to draw a big crowd. Victorian laws were amended in March to permit cage-fighting, which the UFC immediately jumped on by announcing a high-profile fight card in Melbourne. 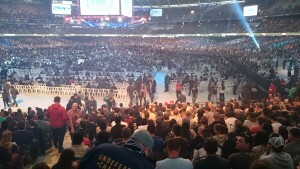 The UFC grew into a large-capacity arena business many years ago, but Etihad Stadium is a whole new scale of venue with room for 60,000 punters, thick rows of plastic chairs laid out on the field area. 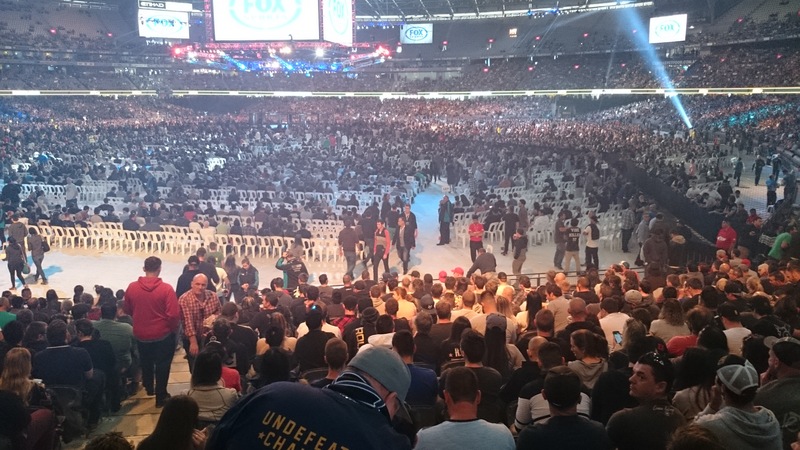 While the upper tiers look a bit patchy, UFC attendance records have been broken today. Large groups of police move through the crowd, body armour tucked beneath their high-vis vests, the gunshots of Paris doubtless ringing loudly in their pre-event briefing. The audience is asked to observe a moment’s silence for the French attack victims; even when a blast of electro house suddenly cuts through the silence, the crowd remains standing, mournful and confused. 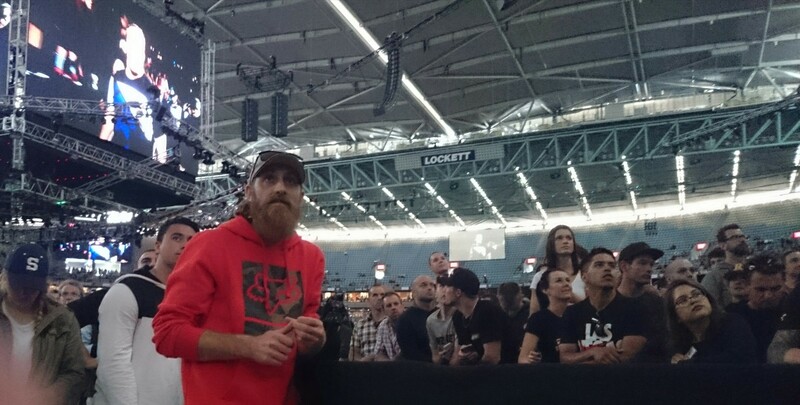 The majority of fights at UFC193 feature Australians, something of a host country privilege. Most of the locals fare pretty well, with victories from young Jake ‘The Celtic Kid’ Matthews and Robert Whittaker drawing ecstatic roars from the crowd. Other fights are less impressive; a heavyweight bout between the towering Stefan Struve (Netherlands) and stocky Jared Rosholt (USA) is a dull affair of timid circling and lethargic wrestling. The crowd repeatedly boos, demanding bloody satisfaction. “You’re allowed to punch him, big fella!” someone shouts, which draws a big laugh from the restless arena. The co-main event for the day – which is to say, the second most prestigious fight – is a showdown between reigning women’s strawweight champion Joanna Jedrzejczyk (Poland) and Valerie Letourneau (Canada). Like Rousey, Jedrzejczyk has dominated her division since its inception, and the prediction is that Letourneau will end up on her back, bleeding profusely from multiple gashes to her face. Instead, the women trade shot-for-shot through five excruciating five-minute rounds. Jedrzejczyk ultimately emerges victorious, taking out the fight on points from the judges, but her struggle sets an alarming precedent for the day’s main event. From the outset, however, Holm plays it smart. Slips in to land a quick punch or kick, then backs off. She’s wary of Rousey’s legandary ability to grab her opponents, throw them to the mat, and twist their arms into ungodly angles to force a tap-out. Holm slides in again, lands another punch. Another. And another. Rousey’s nose busts open, and she blinks in surprise. The invulnerable aura is fading, fast. “Ooooh, we might make it to the end of the round!” the guy in the crowd remarks. And sure enough, the bell dings and the women are sent to take a thirty-second breather. The crowd is going ballistic – it’s been almost two years since anyone has managed to take Rousey to the second round. Holm is deconstructing the legend, one blow at a time. Then it happens – Holm manages to stagger Rousey, then knocks her out cold with a kick to the head. She dives in to finish off the champion with a blur of punches, but it’s overkill – Rousey is finished, the referee waves off the fight, the impossible is done. 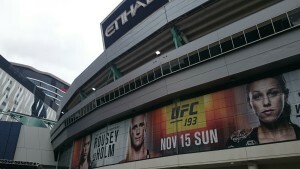 Etihad Stadium is on its feet, roaring its approval, screaming out in support of Holly Holm the Queenslayer.